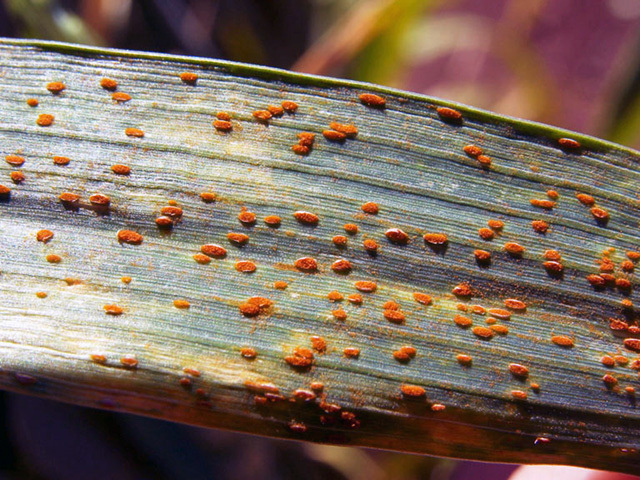 Chive rust is a serious fungal disease that infects onions, chives and other members of the allium family. The symptoms appear as small dull orange oval-shaped pustules on the leaves, and renders the chive crop useless. The leaves turn yellow then wither and die prematurely, whereas with onions and garlic, the infection is likely to reduce the bulb size. Later in the season the orange lesions turn black and fill with spores, these survive through the winter months. No fungicides are currently available to amateur gardeners to control this problem. To control the outbreak, promptly remove and destroy all infected plants. Because the surrounding soil may contain resting spores do not plant plants of the allium family in this area for two or three years.